The Center for the Intrepid National Armed Forces Rehabilitation Center at the Brooke Army Medical Center, in Fort Sam Houston, provides military patients and veterans with severe extremity injuries, amputations, and burns the best opportunity to regain their pre-injury abilities in a supportive, healing environment. The center is said to be the most advanced rehabilitation facility in the world. Counsilman-Hunsaker was enlisted as an aquatics specialty consultant to provide specific expertise on the various programming spaces in the facility. 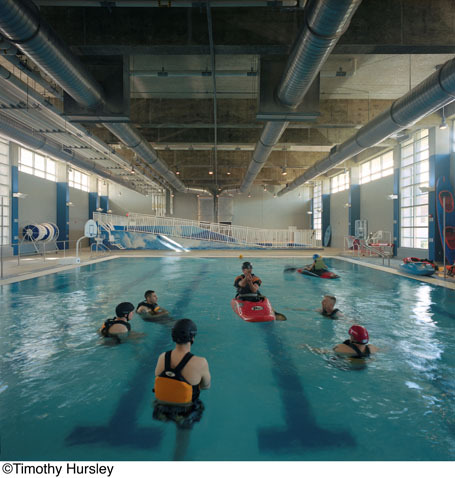 Therapy Pool – the 30 ft. by 50 ft. six lane split pool consists of multiple water depths and accessible entry points, providing numerous therapy and training programs including kayaking, water basketball and volleyball, water polo, and swimming. FlowRider – a unique indoor simulation of a natural ocean wave used to improve balance, coordination, motion, strength, motivation, and confidence. This feature’s propulsion technology creates an inclusive and exhilarating activity that’s safe and enjoyable way to progress rehabilitation.